Complex-shaped particles could find many uses. Biocompatible gold nanoparticles have generated considerable interest in recent years because they hold promise in the domains of imaging, sensing, labeling and medicine. However, researchers’ enthusiasm has been tempered by multiple-step procedures and by the salt-induced aggregation inherent in the synthetic strategies typically used to prepare the nanoparticles. In 2007, investigators reported a relatively simple one-step procedure for preparing biocompatible gold nanoparticles, but it can produce only small spherical nanoparticles that are approximately 2 to 5 nm in diameter, which limits the range of applications. Researchers have reported complex-shape gold nanoparticles that offer greater control than conventional spherical nanoparticles when tuning their optical properties, forexample. This characteristic could advance a range of bioimaging applications. Shown here is a transmission electron microscopy image of the particles. In the Feb. 5 issue of Langmuir, a group with the Chinese Academy of Sciences in Changchun and with Kwansei Gakuin University in Sanda, Japan, reported a strategy with which to overcome these various obstacles and thereby advance various applications in bioimaging. Lehui Lu, the first author of the study, outlined the guidelines used in developing the strategy: (1) The gold nanoparticles should be monodisperse, water-soluble and highly stable against salt-induced aggregation in biological applications; (2) the particles’ surface plasmon resonance should be tunable over a relatively large range; and (3) the particles should have complex shapes that yield greater control when the nanoparticles’ optical properties are adjusted. They achieved these goals, in part, by using gelatin as a template for controlling the shape and orientation of the nanoparticles during synthesis. Gelatin, the denaturation product of collagen, is used widely in food, pharmaceutical and medical applications. They applied it for synthesis of nanoparticles because the presence of particular functional groups permits modification for a variety of purposes. The scientists synthesized complex-shaped gold nanoparticles — having a studded, quasispherical shape not unlike that of sea urchins — and characterized them using various methods. They obtained transmission electron microscopy images using an instrument made by FEI Co. of Hillsboro, Ore., and recorded x-ray diffraction patterns using a high-resolution x-ray diffractometer made by Rigaku Corp. of Tokyo. They acquired UV-visible extinction spectra using a Thermo Nicolet (now Thermo Fisher Scientific Inc.) spectrometer outfitted with a mercury cadmium telluride detector. 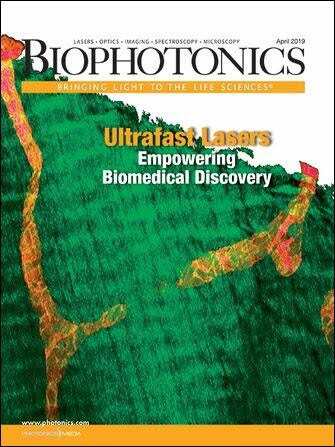 Finally, they used a Dilor confocal microprobe Raman system to gather Raman spectra. An air-cooled HeNe laser provided excitation at 632.8 nm, and an air-cooled 1024 × 256-pixel CCD served as a detector. The transmission electron microscopy images verified the presence of a large number of nanoparticles that were highly monodisperse in the sample; high-magnification transmission electron microscopy images confirmed the complex shapes. The researchers observed that the particles in the sample exhibited irregular shapes and noted a mean diameter of 16 ±4 nm. All of these findings underscored the role of gelatin in controlling shape and orientation during synthesis of the nanoparticles. The UV-visible extinction spectra helped the researchers answer questions about salt-induced aggregation. Nanoparticles used for biological applications must be stable against such aggregation because buffering and salt solutions typically are involved with bioassays. The investigators saw no notable shift in the extinction spectrum within the first hour of the experiment, underscoring the stability of the nanoparticles at high concentrations of salt solution. Having characterized the particles, they tested them for a particular application: nanoparticle-based surface-enhanced Raman spectroscopy. Other groups have shown such techniques to provide a sensitive approach to bioassay applications, especially in living cells — transferring gold nanoparticles in the interior of a cell, for example, and obtaining high-quality signals corresponding to various components of the cell. The authors of the present study reasoned that the gold nanoparticles that they had synthesized could provide even better signals because the phenomena underlying surface-enhanced Raman spectroscopy take place at crevices or rough surfaces, and the nanoparticles’ shapes offer plenty of these. The experiments bore this out. Using the adenine, the investigators recorded the surface-enhanced Raman signals from the sea-urchin-shaped nanoparticles and from the spherical nanoparticles, both about 45 nm in diameter, and found that the signal intensity from the former was roughly 10 times higher than that from the latter. Because the nanoparticles are highly stable in salt solution and water-soluble and because they offer tunable surface plasmon resonance properties and excellent surface-enhanced Raman spectroscopy ability, they could contribute to a wide variety of optical imaging-based applications in disease diagnostics and therapy. The disadvantage, Lu said, is that, at higher temperatures, gelatin molecules can separate easily from the surface of the nanoparticles. The investigators are working to address this issue and are exploring additional applications of the particles to bioimaging.